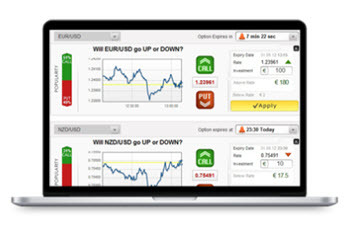 Binary options are a type of financial instrument that makes it possible to earn a lot of money quickly. They are associated with very high risk and 95% of all people who start trading with binary options will lose their first deposit. I do not recommend that you trade with binary options unless you are an experienced trades who understand how they work and what it takes to make money. Experienced traders who choose to trade binary options should limit their trading accounts size to 1-2% of their total invested portfolio. Binary options are a type of financial instruments that allow you to speculate on the market movement of underlying financial instruments such as stocks, currencies, indices and commodities. There are different types of binary options but the most common type requires you to correctly predict whether the market value of a certain financial instrument will go up or down before the time of maturation. If you correctly predict the movement of the underlying instrument then you get a high return on investment. If you are incorrect in your prediction then you will lose your entire investment. Binary options can not be sold or traded. Binary options has a very bad reputation and are often referred to as scam. This is not true but is still a well deserved reputation. 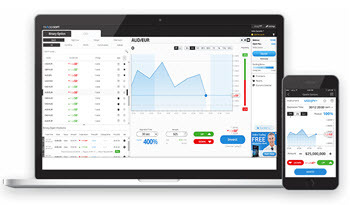 Binary options themselves are not scam but there has been a number of brokers on the market that has been scams and that made it almost impossible for their clients to make money. These brokers have caused the entire market to get a bad reputation. These brokers would make sure that you always lost all the money that you invested with them. Thousands of people lost a lot of money to these scam brokers. These brokers do however not reflect the business as a whole and there are a large number of honest brokers that you can choose from. You can learn more about how to chose an honest broker further down or by visiting this website. Binary options are not a scam if you chose a honest broker. You do however still risk losing all the money you invest and you will still need to be a skilled investor to pick the right options to be able to earn money from binary options. It is very important to choose the right broker. Choosing a good broker makes it a lot easier to make money. Each broker decides which options they want to offer and which return they want to offer if the option matures in the money. You should look for a binary options broker that offer binary options based on financial instruments that you know a lot about. This makes it easier to make money. You should always choose a regulated broker with a good reputation. Choosing a regulated broker is a good way to avoid scam brokers. You should choose a broke that is regulated in the UK, US, on Malta or Cyprus. I recommend that you read a number of reviews before you decide which broker you are going to register with. This gives you an extra level of security and decrease the chance that you chose a dishonest broker.